In India people are still not completely comfortable with inter religious marriages so marriages into different cultures might definitely take much adjustment. Even when one marries someone of the same background- differences in habit and viewpoints crop up. Speaking styles, styles of arguing, teasing, listening, child rearing, protocol with each others parents, monetary responsibilities, issues come into play when you belong to two different worlds -literally. Georgetown University linguistics professor Deborah Tannen, author of I Only Say This Because I Love You: How the Way We Talk Can Make or Break Family says intercultural couples often attribute disagreements to other factors when the real cause is a difference in conversational style. In Annie Hall, Woody Allen plays a Jew from Brooklyn who falls for the WASPy Annie (Diane Keaton). During dinner at her house, he feels completely out of place in the sedate Norman Rockwell-like setting, contrasting it with his all-speak-at-once, chaotic family meals. However when the language is that of love, differences dissolve into the melting pot of understanding and one-ness. 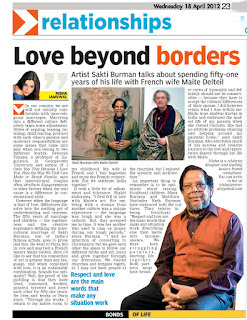 Fifty years of marriage, children, togetherness and creative supremecy in the intercultural marriage of Sakti Burman- one of India’s most famous artists –goes to prove just this. Hewent to Paris, fell in love with and married French beauty, Maite Delteil while they were studying art at Ecole Des Beaux-Arts. -Here I’d say, the connection of art is greater than any language, and when conjoined with love is an unbeatable combination. Sounds too optimistic? Well the proof of the pudding is that they have lived , romanced, worked, painted, travelled and loved each other only more every year for fifty one years. He lives and works in Paris since “Through my works I return to my native roots, to my childhood , my wife is French and I buy baguette enjoy the French countryside, but we celebrate India together”. “I first fell in love with Maite’s Art. For me being with a woman from another culture was a unique experience, the language was tough and she was a catholic. But they accepted me in time. It was her mother who used to loan us money in our tough periods, after all we were struggling artists” avers Burman. An important thing to remember is to be optimistic about raising bicultural children. Maya Burman and Matthieu Navindra Nath Burman have embraced both cultures, and rejoice in being bicultural. “Respect and love are the main words that make any situation work. Everything then melts into inconsequence. "We were both struggling painters, starting life together. Both partners must have broader views of ummanity, and definitely should not be conservative because they have to accept the cultural differences of their spouse. I did however retain what I was within. Maite wore shalwar kurtas in India and embraced the modest life of my parents when she visited Calcutta. 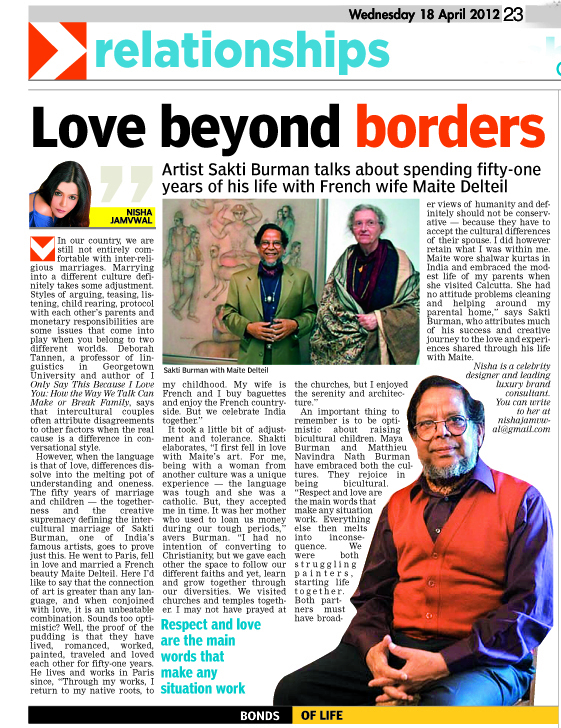 She had no attitude problems cleaning and helping around my parental home” says Sakti Burman who attributes much of his success and creative journey to the love and experiences through the journey shared through his life with Maite. You need to allow for more than one right way of doing things and let the language of common interests bring you together than letting differences prow a gap, and Sakti Burman embraced the newness of his chosen home and French wife to metamorphose his creativity into something richer, while retaining his roots and cultural contexts. nish the dish , we have to have the courage and the guts, to go into unchartered territory and take the plunge!